Fire Chief Joe Mauro plans to retire this spring. The news was shared at last week’s Board of Selectmen meeting. It reminded me that I never shared another announcement from July. Recreation Director Doreen Ferguson will retire next summer. Town Administrator Mark Purple announced that the Fire Chief submitted his official notice. He will retire when his contract expires on March 4th. Mauro has spent his entire career in the Southborough Fire Department. He’ll be retiring four months before the scheduled “substantial completion” of Southborough’s new public safety complex. I looked back at coverage of Mauro’s promotion to chief. It seems that when he retires in March, Chief Mauro will have served 38 years on the SFD. Mauro has been a name associated with firefighting in Southborough for decades. Joseph joined the Southborough Fire Department in 1981 as a call firefighter, rising to the position of captain in 1987. Brother John Jr. retired last fall after 38 years in the department, 11 of them as chief. In 2010, their father John Sr. retired after 50 years with the department. A 2011 story shared that the father and sons weren’t the only firefighters in the family. Joe’s and John Jr’s grandfather, great uncle, two uncles and a cousin also served. Joe was raised in Southborough, joined the SFD as a firefighter in 1981 and eventually served as the union representative. But it wasn’t an automatic step up to fill his brother’s seat when he retired. There was a protracted search process from 2011-2012. The last search required the board to appoint an interim chief. At one point the position was narrowed down to two external candidates before one dropped out. 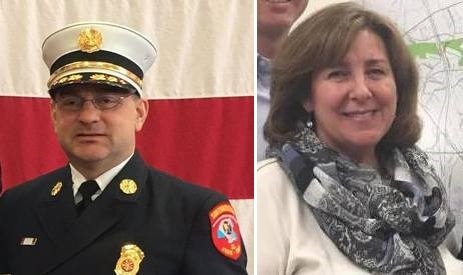 Selectmen opted to rewiden the field of finalists to include two internal candidates – Mauro and Lt. Chris Dano. The lengthier than expected process then, and past police chief searches (fraught with their own issues), may be part of the reason Purple is looking to act quickly on the search for the next emergency chief. Given workloads for Town staff, Purple said he is likely to ask for a consultant’s to help “shepherd” the process. As for Ferguson’s retirement, that was announced by Recreation Commission Chair Kristen Lavault at a July Board of Selectmen meeting. Lavault told the board that Ferguson will be an extreme loss. She has served the department for 10+ years. The commission will keep the public informed of transition plans as part of their updates. The next Rec update to the BOS is also scheduled for next Monday, September 17th. I hadn’t mentioned it, but Ferguson is a Southborough resident.